Since winter 2018, NYC DOT has been meeting with residents (including NYCHA tenant associations), civic and community associations, and parks and business stakeholders to solicit feedback on the project. This presentation has been used for discussion purposes in these meetings. This presentation is updated regularly, most recently on 3/13/2019. View the presentation from the September 27, Project Update Meeting. 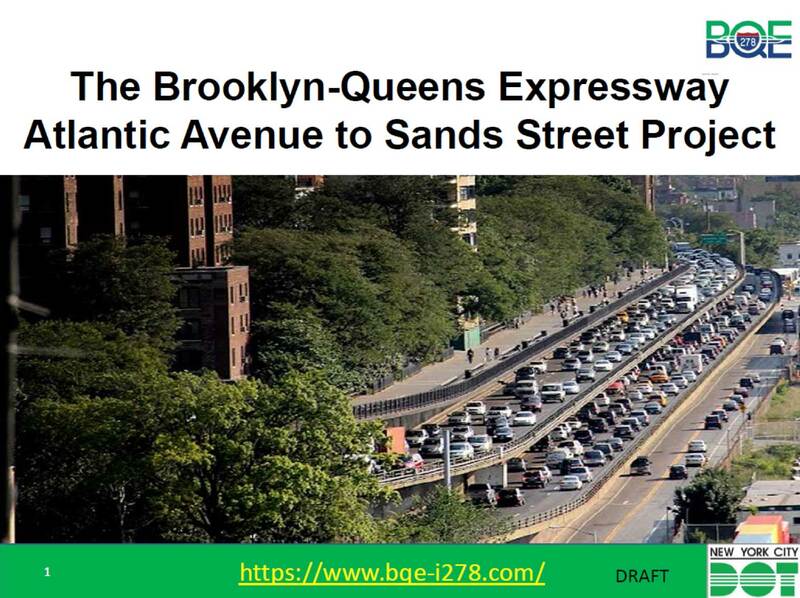 On September 27, 2018 NYCDOT presented two staging options for the BQE Atlantic Avenue to Sands Street project to the public at the NYCHA Ingersoll Houses Community Center. The presentation was live streamed on YouTube and Facebook. For clarity, Program Manager Tanvi Pandya re-recorded audio over the presentation slides and it can be viewed at this link. Extended versions of the videos from 9/27/18 that were cut short due to time constraints are included in this version. Please stay tuned to this website for more project updates and stay in touch using this link. Click here to download the Meeting Presentation PDF.